The Safe Staffing for Quality Care Act will set nurse-to-patient ratios in New York healthcare facilities. A bipartisan coalition is supporting it in both the New York State Assembly and Senate. Nurse ratios. The bill establishes nurse to patient ratios by unit. No nurse can be assigned responsibility for more patients than the specific ratio. Hospitals that violate the law will face civil penalties. Staffing for acuity. The ratios set a floor, not a ceiling. Hospitals are required to make a staffing plan that addresses changes in patient acuity by staffing as patient needs dictate. 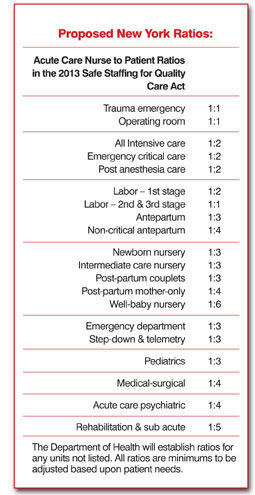 Hospitals cannot count assistive personnel toward ratios. Assistive personnel do not count toward the licensed nurse-to-patient ratios. Hospitals are required to provide a sufficient level of assistive personnel. Public disclosure. Hospitals must disclose staffing levels to the public. No averaging. The ratios are the maximum number of patients assigned to any RN at all times during a shift – not an average. Floats. The law requires hospitals to staff units using nurses with a demonstrated competence in that clinical area, and who have undergone an orientation for that clinical practice. Nursing homes and other facilities. In nursing homes the bill sets minimum care hours per resident, per day for RNs, LPNs and CNAs. The minimum hours of care per resident, per day are as follows: RNs: 0.75 hours divided among all shifts to provide an appropriate level of RN care 24 hours per day, seven days a week; LPNs: 1.3 hours; and CNAs: 2.8 hours.